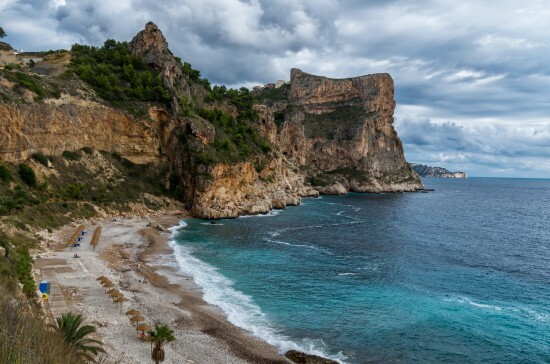 One of the main attractions of the Valencian coast is its variety of landscapes and the beauty of different enclaves, like the urban beaches of the three capital cities, the beaches far from the urbanization and the bays hidden in the spectacular natural landscapes. From Valencia to Alicante we offer you a different way to make tourism in summer, beach bar after beach bar. For many years the absence of the beach bars in Valencia has caught the attention. We define “chiringuito” a seasonal bar installed into the proper sand of the beach or bay with music that offers relaxing moments during the sun baths but also moments with a great animation that may last until the afternoon or night party. These bars have a large menu of refreshing beverages like tinto de verano, beer, mojitos and several classic cockatils. The icecreams, sandwiches and paellas are optional and depend on the size and the style of the place. Summer in Valencia is easier if you take a fresh walk around the seaport and the promenade. At the Patacona beach some small bars have already started to open on the sand like La Más Bonita, a hipster brand in the catering of the city, that diversify its offer. Another excellent way to end the day with a pleasant breeze is to take a walk around Marina Real Juan Carlos I until Malvarrosa beach and “playa de las Arenas”. Taronja School as the rest of the Schools that belong to the Spanish Federation of Schools of Spanish as a Foreign Language, understands that its courses for foreigners must be adapted to any moment of the year. That is why we offer more than courses in the classroom. Especially in summer social life and beach are integrated fundamentally. Leaving from the city towards the South after the popular costal town Cullera, we find the “chiringuito” Sol y Luna in the Xeraco beach. Chill out and house musics with sun beds and menus are here a good option to spend a good time with the family or friends. Reaching Gandía we land in one of the hottest places of the Valencian summer. It has a population multiplied by tourists from all over the Spain and an unlimited offer of nightlife like clubs and beach bars on the sand of its principal beaches, North beach and Ahuir beach. 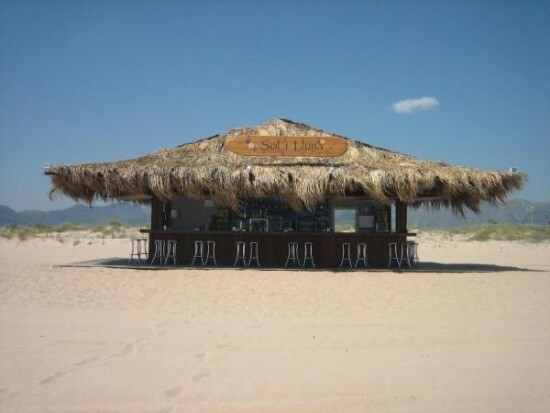 Despite everything, the Oli-Ba-Ba “chiringuito” is the focal point of reference for all the other beach bars. It is located in the Oliva beach, on the border with Valencia province and with the rock mass Montgó in the background. 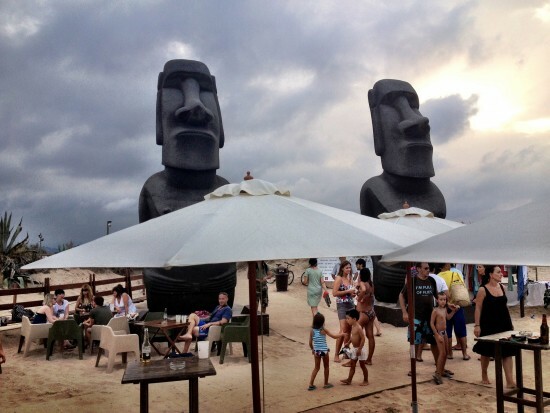 Its Moai icons on the slim withe sand surround each side of the bar and form a spectacular landscape together with the dunes of the spwraling Olivense beach (at 12 kilometers). With a truthful and varied audience of different ages and nationalities, and the inspiration of the Easter Island that appears in any details, any day of the week is a good moment to take a mojito or enjoy the very selected music. Entering the Alicante province it is worth noting the available offer in Denia’s seaport of which clubs and bars, with much foreigner concurrency, and the Cocoro located in the Moraig de Benitatxell, very close to Jávea. The access is a little bit hard, but the fresh and crystalline waters of the pebble cove are impossible to forget.